Activated Alumina has much micro-paths, so the specific surface is large. 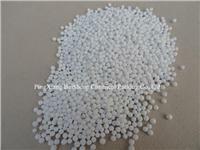 It can be used as absorbent desiccant and catalyst carrier. It is also a kind of trace water desiccant and the pole-molecular absorbent, according to the absorbed molecular polarization, the attachment force is strong for water, oxide, acetic acid, alkali etc. Activated alumina defluorinated just as the anion exchange resin, but the selectivity is much strong. The defluorination effect of the actived alumina is good. The capacity is stable, the absorbed fluorine is 6400g/cm3. It has high strength, low abrasion, no soften in water, no expansion, no powdery, no crack. It can widely used in the deep drying of cracked gas, ethylene and propylene, hydrogen-generation, air separation, instrument air drying and fluorine treatment for H2O2, also in the absorbing pollution material, such as H2S, SO2, HF and paraffin in the water gas, especially in the drinking water defluorination.